“Orchids of War” by Denise Frisino is an intriguing mystery set during the months prior to the Japanese attack on Pearl Harbor. A young and attractive Seattle woman (of German and Irish heritage) is enamored with Japanese culture and becomes fluent in the Japanese language. For this, she is recruited by an F.B.I. agent to spy upon Japanese agents who are, in turn, in America spying on the U.S. She takes on the role reluctantly at first, but becomes quite adept at it and a true heroine. Both Billie, the Seattle woman, and Jack, the F.B.I. agent, are well-developed, sympathetic, and believable characters. The relationship between the two evolves slowly through the story and is very well crafted. The settings of the story (Seattle, San Francisco, and Hawaii) and the minor characters are described with just enough attention to detail to give the reader an appropriate vision without getting too bogged down on unnecessary detail. The author also pays attention to the historical context, and the reader feels the growing tensions between the United States and Japan, which ultimately lead to war. The book is not without flaws. The novel’s dialogue often reads as if it came out of a 1940s movie, which may have been intended by the author, but people don’t speak that way today and probably didn’t then. There are many coincidences in the story, which is often characteristic of mysteries and fiction in general, but there may be a few too many in “Orchids of War.” And, the Japanese spies seemed to know far too much about Japan’s intentions towards Pearl Harbor, and it is unlikely that spies in America would have been in the loop of such a top-secret operation. The book also starts at a slow pace, and Billie’s role in the plot doesn’t pick up until after 150 pages or so. When the pace does pick up, “Orchids of War” moves from good to very good. Frisino does an excellent job of sprinkling clues and foreshadowing events, as well as building suspense throughout the mystery. The spies on both sides are a bit amateurish, which was probably the case in 1941, and this interwoven throughout the story. 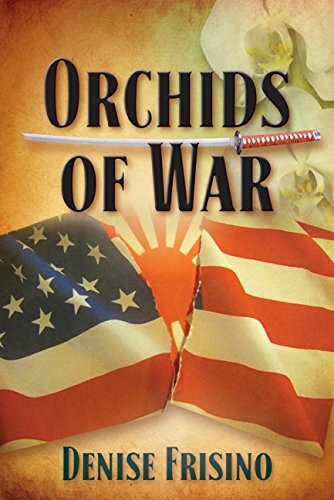 "Orchids of War" by Denise Frisino is an entertaining work of historical fiction, set at a troublesome time of which we often forget. America was still at peace, and perhaps naïve, but on the verge of joining a catastrophic world war. Those times provided an excellent backdrop for a spy mystery, and Frisino tells it well.